104 Schooner Bay. This beautiful, recently renovated condominium is conveniently located in picturesque Gallows Bay high on a terraced hill overlooking Christiansted Harbor. Just steps from the pool, and fully equipped with all the comforts of home, this condo is just right for vacationers and business guests alike - whatever your reason for visiting St. Croix might be! Gallows Bay and nearby Christiansted offer fabulous shops, restaurants and entertainment. Some of the best and most prestigous beaches are just minutes from you door on the eastern side of the island. Go west and find facinating museums, botanical gardens, historical Fredericksted (another port town), snorkeling, golfing and even more beaches! But don't forget to get home in time to watch that beautiful sunset from your own private balcony! Then head back to town for even more fun! 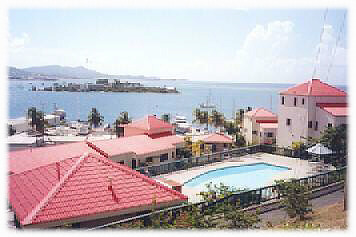 Harbor view, sunset view over mountains, convenient to shopping and amenities, very near beautiful beaches. Master bedroom has own bath. Other amenities not listed above: Two pools, lighted tennis court, 24-hour security.